No one has mastered the art of predicting what is going to be a box office hit, not even with the latest big data analytics. But with Canvs, studios have the power to get early reads on films and trailers, measure campaign effectiveness, and predict box office outcomes with more accuracy than ever before. Recently, we looked at several films that faced highly negative critical reviews early on: Batman vs Superman (2016), Suicide Squad (2106), and King Arthur: Legend of the Sword (2017). The first two scored high with audiences and generated huge profits for the studio. The last became a record-breaking flop, even though it also received high marks from audiences. Using Canvs Movies, we will look at what could have been done differently to avoid this disaster at the box office. Canvs measures emotions in any conversations around a film or trailer, especially social conversations on Facebook, YouTube, and Instagram. We report how passionate people are about the content – how many Emotional Reactions they express – what kind of emotions they express, and what’s driving these feelings. And we enable you to search, filter, and compare data quickly and easily in order to find answers to your most pressing questions. The beauty of Canvs is that often reveals answers to questions that you haven’t even thought to ask. Warner Bros.-DC Entertainment has faced an uphill battle in recent years in its effort to compete with the Marvel-Disney universe. Despite star-studded casts and high-budget productions, Batman vs. Superman and Suicide Squad both received incredibly poor critical reviews and were at serious risk of being the biggest flops of 2016. Except that audiences disagreed with the critics and made these films into hits. Combined, they generated $1.6B for Warner Brothers, 33% of the studio’s total annual revenue for 2016. 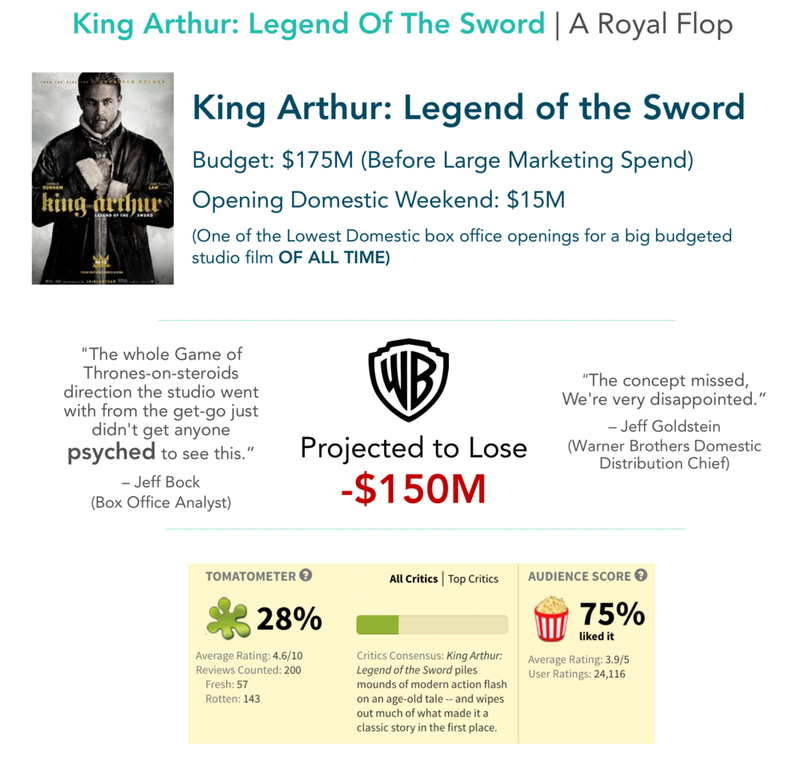 Compare those results with the fate of King Arthur: Legends of the Sword (2017). The Warner Brother’s epic fantasy, written and produced by Guy Ritchie and starring Jude Law, was intended to become a six-film franchise. Instead, it was crushed by low opening weekend turnout and poor reviews, with critics warning audiences to stay away. The planned sequels were cancelled after it lost Warner Bros. $150 million. So what’s the difference? Why couldn’t King Arthur turn it around as Batman vs. Superman and Suicide Squad had? The answers can be found by using Canvs Movies to look at early conversations around the film and its trailers. By analyzing Emotional Reactions including what audiences Loved and Hated most, we can identify numerous opportunities and threats that were overlooked in the film’s marketing. Even though King Arthur: Legend of the Sword received extremely poor reviews and was not destined to be a hit, the comparison with Batman vs. Superman and Suicide Squad shows that it did not need to become a flop. The audiences who did see it generally enjoyed the film, and it received a 75% Audience Score on Rotten Tomatoes. Canvs can allow you to optimize marketing based on what viewers say they Love. For example, Canvs Movies reveals that Aiden Gillien (from Game Of Thrones) was one of the most Loved topics in social discussions of Arthur. Clearly, he should have been featured in more than just 3 seconds of the official trailer. Canvs enables you to address issues viewers say they Hate and Dislike. For example, fans who saw earlier trailers indicated they thought the CGI in Arthur was poor quality. Showing more realistic shots in later trailers could have avoided this issue. Viewers also expressed Dislike for Guy Ritchie. Efforts could have been made to focus less on his name and more on his commercial success (e.g., “From the director behind Sherlock Holmes”).